Like you see, Miku’s Pokemon Adventure post includes parts: Description (Story/Plot included in this part), Screenshots, Images, How to download. If some trailers are not available, we will add later. A Pokemon ROM/Game hack by Airikita using Pokemon Gold Codebase/Engine in English. The last update happened on May 24, 2018. Miku’s Pokemon Adventure : A newbie in the Pokemon hacking world wants to show off his new fan made game: Miku’s Pokemon Adventure. Just download and try it yourself. It has been created by Airikita and it is a good fan-made game. 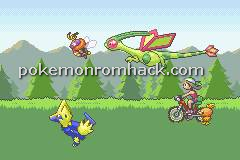 Don’t forget to try other games at pokemonromhack.com, we also have other stuffs of Pokemon Hacking such as hacks, emulators, tools. Please take a little time to explore these. Thank you.